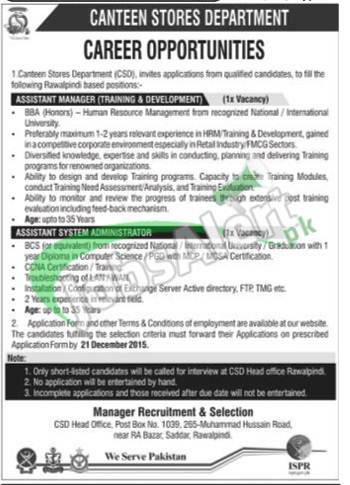 Here you will get information about CSD Jobs Application Form 2015 Canteen Stores Department Pakistan. Canteen Stores Department looking to recruit the individuals against the position of Assistant Manager for the training and development department and Assistant System Administrator. They require the eligibility criteria of education for the post of Assistant Manager is BBA in human resource management and for Assistant system administrator it is BCS or equivalent degree in relevant field. They want at least two years experience for these positions in a relevant filed or from reputed or from a well-know institute. Candidates can download the application form the link that is given below in this post. Candidates have to send all details and documents at the address that is given below in this post. Last date of submission is 21st December, 2015.